Playoff Fever: The Downtown Stadium Debate. If you’re like me you’ll be glued to the TV this weekend to celebrate the NFL playoffs. With a dog in the fight this year, I’m more excited than ever. Paying close attention to the hype my home city is getting leading up to the big home game (first since 2008), I can’t help but think about that unending urban design debate: should stadiums be downtown? The argument is a simple one: don’t build such a huge structure in the middle of the city that only hosts 8 games a year. At first thought, this seems to be a pretty reasonable argument. 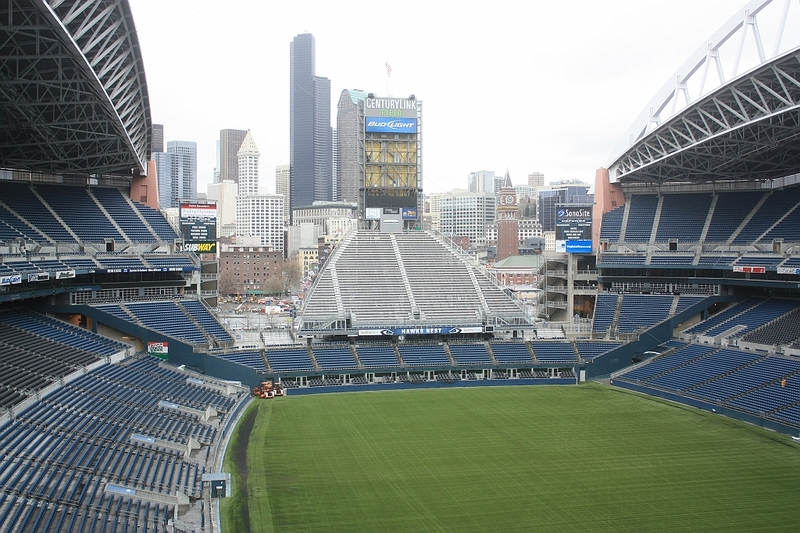 NFL stadiums are huge and when it’s not a game day they’re pretty quiet. You could call them Sleeping Giants. 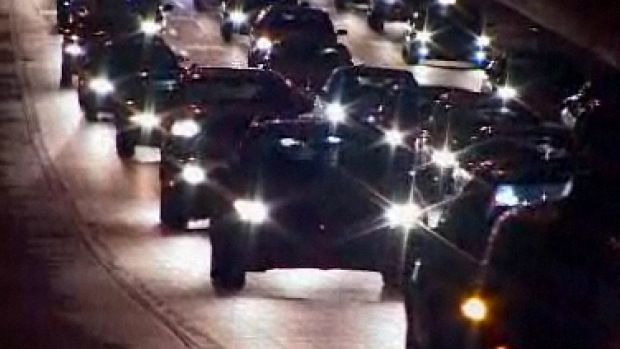 After years of neglect, downtowns are attracting residents and visitors. Employment, entertainment, and tourism have become stronger in cities, and while the number of residents is increasing, 24/7 mixed-use downtowns are still something of the future. I’m a strong believer that any activity is better than no activity. For many people, their NFL team is what connects them to their city more than anything else – why send the team to the suburbs instead of using it as a tool to strengthen the downtown? 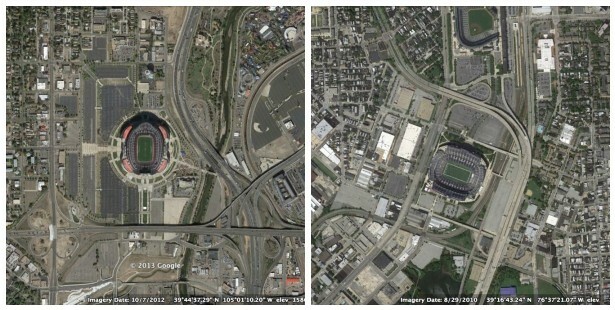 Downtown stadiums are usually very well planned and in locations least likely to compete against potential development. 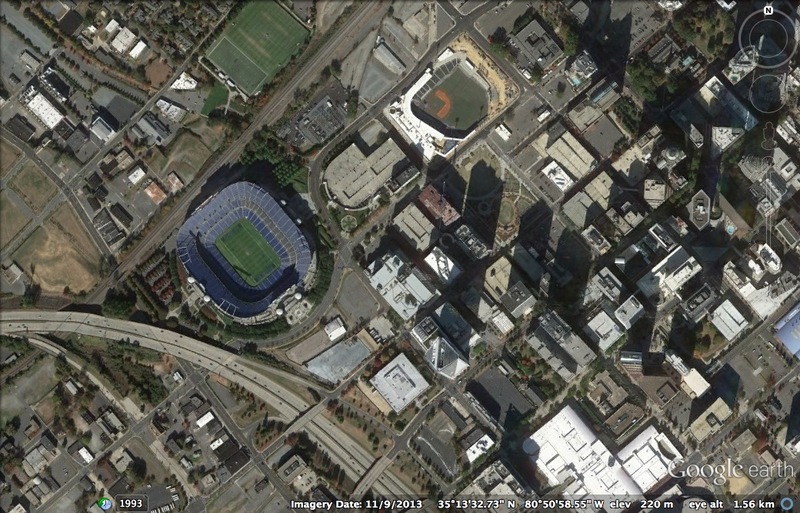 In Charlotte, Bank of America stadium is nestled at the intersection of the interstate and active freight train line. Even after two decades, there are still numerous redevelopment opportunities downtown that are more attractive than the stadium’s location. The edges of an interstate and train track are dead with no potential to influence human activity. Now a beautiful stadium buffers those edges. While it’s only in full swing 8 times a year for NFL games (in addition to hosting a few other sporting events), it provides a wide sidewalk shaded by mature canopy trees that is sometimes used as a route for pedestrians and cyclists. A space that was once vacant, now hosts a landmark upon arrival to Charlotte’s downtown. Sports Authority Field at Mile High in Denver is similar. Located at the intersection of two interstates it buffers the surrounding urban fabric. M&T Stadium in Baltimore sits next to the interstate and a waste treatment plant, once again buffering a downtown entertainment district. Bank of America Stadium in Charlotte is especially sensitive to its context. 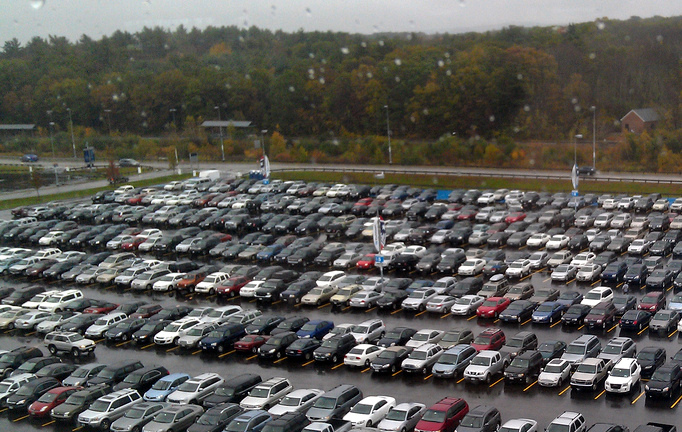 Instead of taking land to build large surface parking lots, it uses existing lots and garages not used on Sundays to meet the parking requirement. It also takes advantage of its location close to light rail and premium transit. When people go to a game, the spend money. At hotels, restaurants, bars, gas stations – everywhere. Undoubtedly it’s better for that money to be spent downtown instead in the suburbs. On particularly big games, like playoff games this weekend or college bowl games it brings immeasurable publicity. It makes the city relevant to the rest of the country and puts it on the map. In Green Bay, Charlotte, and Baltimore there’s buzz in the press. There is nothing that pulls at my heartstrings more than sitting in the upper level and seeing my city in such a unique perspective. And I’m not alone. Being able to see your city while your team runs 73 yards for a touchdown undoubtedly can reinforce city pride and emotional connection to place. Most importantly, having an NFL stadium downtown gets people in the habit of actually going downtown. Unless they work there, some people choose never to go downtown, instead creating emotional ties with their suburban environment. Hopping on the light rail or spending the day downtown builds relevance for the city with those it might not otherwise reach. And then sitting here for another hour.